The rain came down yesterday for hours. Most of the surrounding counties had flash flood warnings, including ours. 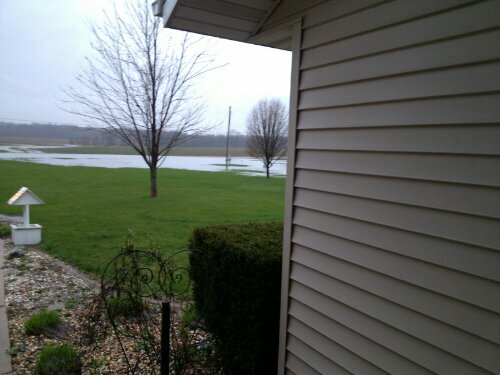 We were lucky not to get water in our basement, but we do now have a moat around our house. 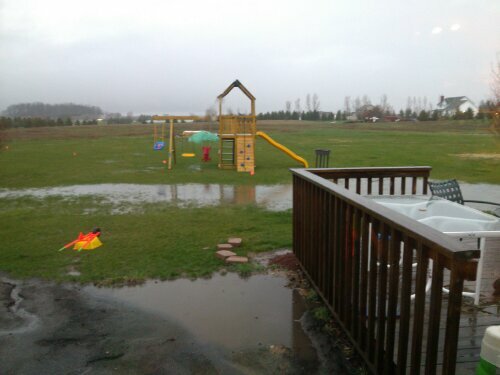 We often have standing water in our yard after it rains and while some people may look at this as huge problem, we are trying to figure out how to find the benefits and to use the “problem” to our advantage. A huge benefit from this recent deluge of water…our garden beds are soaked down to the wood we piled up before covering with a topsoil/compost mix. As I mentioned, the wood acts as a sponge and much of that water will remain in the beds, irrigating from the roots up. Care of the Earth: This is the first principle because without a healthy earth, we cannot flourish. If you want to learn more about permaculture, Jack Spirko of The Survival Podcast has a great youtube series on the subject. Bill Mollison, considered to be the father of permaculture is also a great resource. We have several ideas on how to attack this problem that we are still working out. 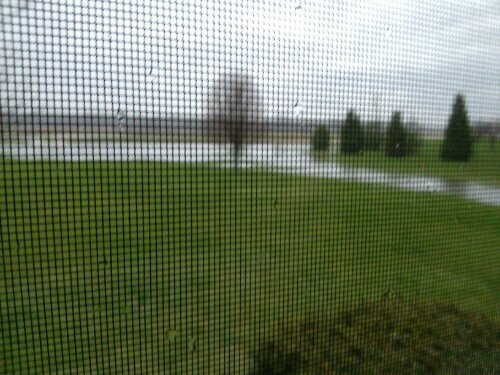 One of the ideas is to create swales, or shallow ditches to contain the water on our property and use it for irrigation. If anyone has any suggestions, they would be most welcome! This entry was posted in Garden Stories, Life. Bookmark the permalink.